Classics Club List #2 ~ Here I Go! With my first Classics Club list complete, it’s time for another. This time it was easy, as I used unfinished books from my first one. So without further ado, here is my second Classics Club List with 50 books to read from November 30, 2018 to November 29, 2023! As we can tell from the first line, Orwell wrote England Your England during the conflict of World War II yet the essay turns out not to be about the war but about something very dear to Orwell’s heart: the British people. Orwell states that the people in the planes trying to kill him must be very much like the British people; but patriotism and national loyalty trumps all, a fact that Hitler and Mussonlini were able to grasp. Differences between nations are based on differences in outlook and the English are highly differentiated, distinctive and recognizable from their country terrain, to their visual appearance, to their manners. Yet while these attributes can vary substantially from area to area, the English have a common national identity. How is that possible among so many differences? Orwell investigates. Classics Club List #1 – Finished! ….. and not finished …. November 18, 2018 has come and gone and I can’t believe that my five year anniversary date with the Classics Club has come around so quickly! It seems like only a year or so ago I was compiling my list and wondering how I was going to read so many books. So how did I do with it? Well, here’s what I accomplished …. 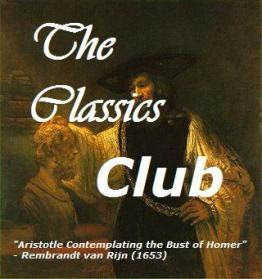 So here is my first Classics Club list, which I will call complete! Where do I go from here …..?? I’m going to condense my original list to 66 and roll many of the ones I didn’t read into my second list. Which I’m going to keep to 50. See! I do learn by experience!! Stayed tuned for the second list which I’ll post soon! Autumn! Autumn! How I love Autumn! And we had a great one in the Pacific Northwest. Sunny skies every day and warm temperatures. I had lots of fun being outside, going for walks and simply enjoying the changes of the season. Even though the rains came in November, October was absolutely gorgeous!! While we have a genealogical continuity between Noah and Abram, Abram’s family did not worship God and were in fact polytheistic, residing in the city of Ur. God appeared to Abram and commanded him to leave his country for a new land. God’s encounter with Abram was unexpected and now signifies a personal relationship with man. Initially, He instructs Abram and offers him blessings for his obedience, and a convenant between the two is later established. On the Lord’s command, at seventy-five years old Abram left Haran for the land of Canaan with his nephew Lot and their families and possessions. 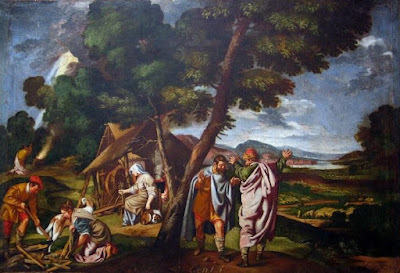 In Canaan at Shechem near the oak of Moreh they built an altar and then, because of a famine, continued into Egypt where Abram convinced Sarai to lie and say she was his sister as, because of her beauty, he was worried the Egyptians would steal her and put him to death. But the Lord visited a plague on the Egyptians and pharoah deduced Sarai was Abram’s wife and after a scolding, sent him away. Abram returned to Bethel. Both he and Lot were so rich in possessions that they decided to part, Lot choosing the plain of Jordan near Sodom and Abram going to Canaan. The Lord declared He would give Abram all the land and Abram settled near the oak of Mamre in Hebron, building an altar to the Lord. A number of kings in the area were fighting against other kings and Lot was taken by the aggressors. Abram armed his servants and defeated the kings, not only rescuing Lot, but bringing back the calvary of Sodom. The king of Sodom came out to meet Abram and the priest, Melchizedek, blessed him and the Lord who delivered the enemies into his hands. 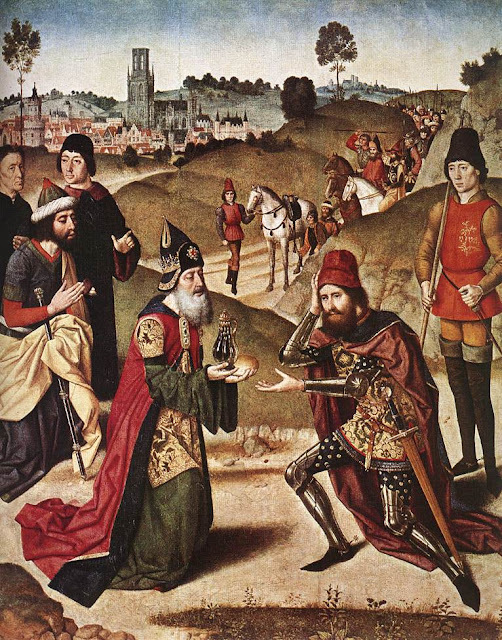 The king offered Abram his calvary but Abram refused to be beholden to him. The Lord made a covenant with Abram, promising that although he was childless, his heir would be his own son and his descendants would be as numerous as the stars. “And Abram believed God, and He accounted it to him for righteousness.” The Lord revealed that his descendants would be in a foreign land for 400 years but He would judge that nation and Abram’s people would return to this land. Then, as the sun went down, a flame appeared with a smoking oven and lamps of fire. Then the Lord made a covenant with Abram telling him of the land he would be given. Frustrated with her lack of children, Sarai sent her maidservant, Hagar, to Abram, telling him to sleep with her and Abram “obeys”. 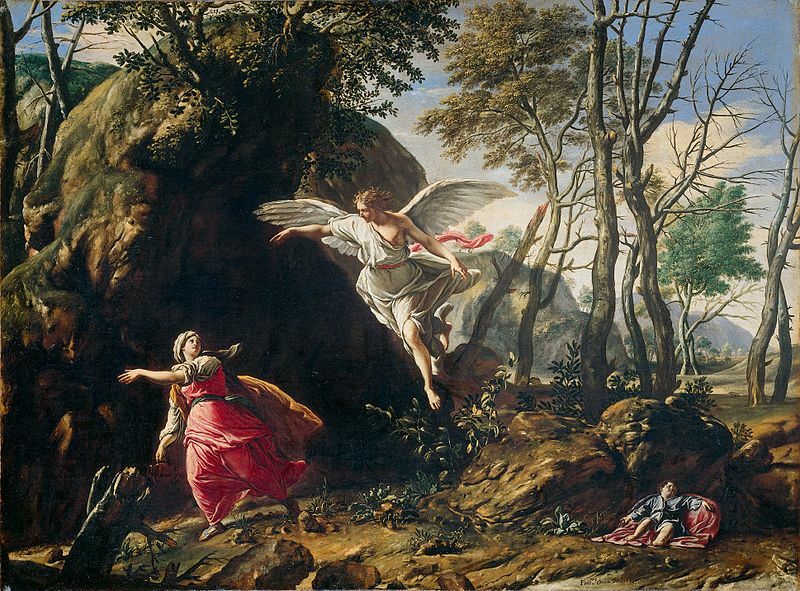 Hagar conceived but Sarai despised her and treated her harshly so the maidservant fled to the wilderness. By a spring of water near Shur, an angel of the Lord spoke to her promising that if she returned to Sarai, she would have many descendants. So Hagar obeyed and bore a son to Abram whom he named Ishmael. God came to Abram at ninety-nine, informing him that he would be the father of many nations. No longer was he to be called Abram, but Abraham, and God would establish an everlasting covenant with him and future generations to be their God. The covenant required that all males be circumcised. Sarai was now called Sarah and she would bear a son. Abraham laughed at the thought of a hundred year old man having a child and tried to present Ishmael to the Lord but the Lord was adamant that Sarah would bear a child, Isaac. Ishmael was blessed with begetting 12 nations but Isaac would have the covenant. 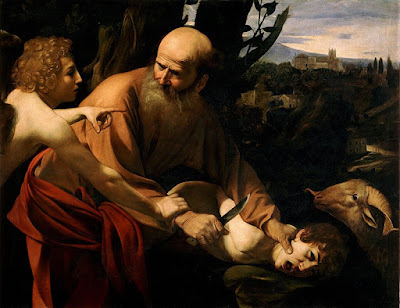 That day, all males in Abraham’s household were circumcised. 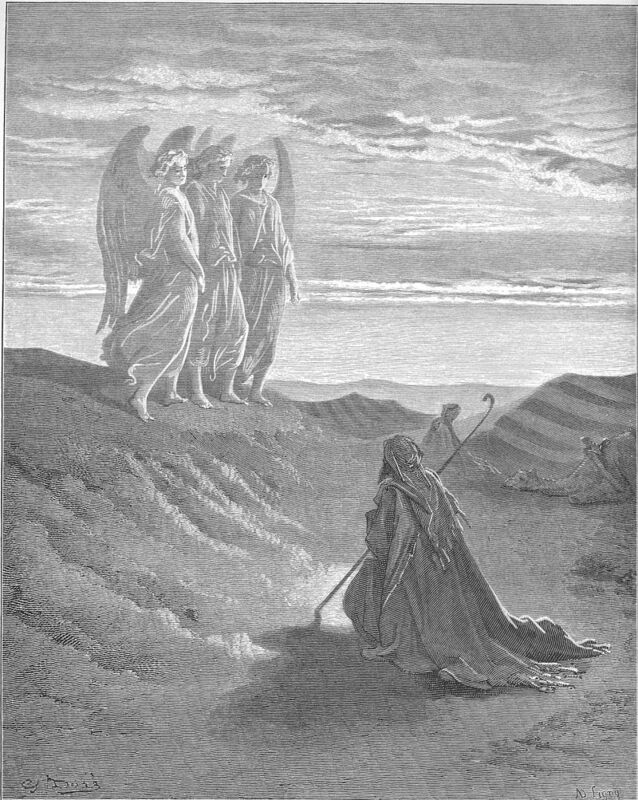 Three men appeared to Abraham as he sat outside his tent in Mamre and Abraham recognized them as God (I think God and two angels). He gave them hospitality, and fed them choice food. God then asked for Sarah, promising them a son and saying, “Is anything impossible with God?” The Lord then revealed that the sins of Sodom and Gomorrah were great against Him. The (two?) men went towards Sodom but Abraham stayed with the Lord, pleading for leniency for these cities asking if there were fifty righteous men, would the Lord destroy the city? The figure gradually reduced to ten where the Lord agreed if that many righteous men could be found, He would not destroy the city. The Lord left and Abraham returned to his place. Two angels appeared to Lot in Sodom who took them in, and gave them hospitality. But the men of Sodom surrounded the house asking to have relations with the men, yet Lot forestalled their wickedness by offering them his two daughters. However the men tried to seize Lot and the men (angels) pulled him inside, striking the men outside with blindness. They then revealed to Lot that they were going to destroy the city and that he should take his relations and leave. In the morning they led Lot and his family out of the city, cautioning them not to look back, and telling them to flee to the mountains, but Lot pleaded to be able to go to the city of Zoar. And as Lot entered Zoar, the Lord rained down fire and brimstone over the cities but Lot’s wife did not heed the instructions of the angels, looked back and was turned into a pillar of salt. Abraham looked towards Sodom and Gomorrah and saw their destruction. Abraham journeyed to the south between Kadesh and Shur and attempted to pull the same trick on Abimelech, king of Gerar, saying that Sarah was his sister. But God came to Abimelech in a dream, even as he had taken Sarah, and warned him. Abimelech professed his ignorance and pleaded with God not to destroy him. When he returned Sarah, he chastized Abraham but the prophet said that he feared he would be killed. Abimelech gave Abraham goods and land, whereupon Abraham prayed to God and Abimelech and his household were healed from afflictions. Sarah conceived and bore Abraham a son, Isaac, and Abraham circumcised him on the eighth day as God commanded. When Sarah saw Isaac playing with Ishmael, she demanded that Abraham send him away and while Abraham was uncomfortable with this request, at God’s word he heeded his wife as God promised that Ishmael too would be a father of nations. Hagar and Ismael set out but when their water was exhausted, Hagar feared death for her son, but an Angel of God arrived with God’s promise and a well appeared before them. Ishmael became an archer, lived in the wilderness of Paran and his mother took a wife for him from Egypt. Knowing that God favoured Abraham, Abimelech, with his friend Ochozath and his commander-in-chief of his army, Phichol, made a covenant with Abraham that Abraham would never be an aggressor towards him or his offspring and that they would live in peace. They called the well at this place the Well of Oath and Abraham remained in the land of the Philistines. 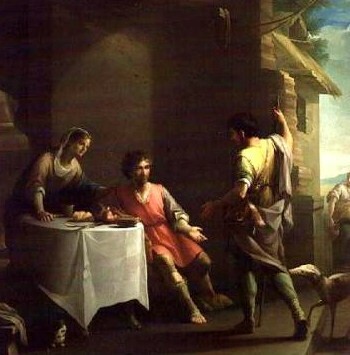 He laid Isaac on the altar and prepared to kill him but the Lord called to him, staying his hand. God now knew Abraham’s fear and obedience was true, and a ram was provided for the sacrifice. God promised Abraham that because of his faithfulness and obedience that He would multiply his seed and he would conquer the cities of his enemies. 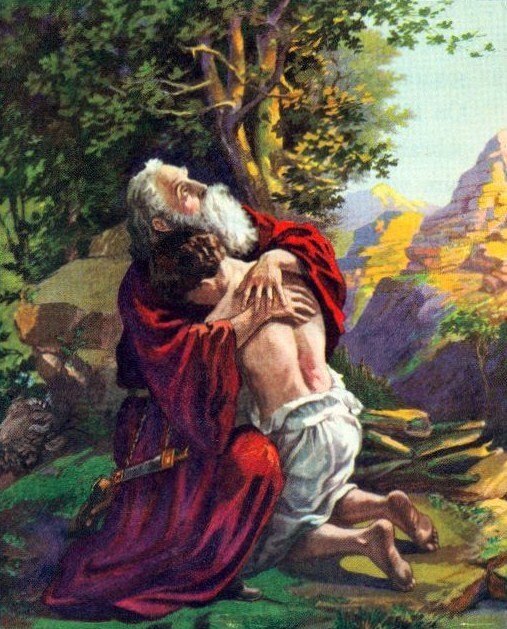 Abraham returned home. We then learn of the children born to Abraham’s brother, Nahor. Sarah died at 127 years of age in Hebron (Mamre). Abraham asked for a place to bury her and was granted by Ephron, the son of Heth, a cave and field in Machpelah, opposite Mamre. Abraham ordered his servant to travel to the land of his tribes to get a wife for his son, Isaac, being very clear he did not want him to choose from the Canaanites. The servant was worried that the woman would not be willing to come, but Abraham said an angel would go before him and if she would not come, he would be released from his oath. The servant placed his hand under Abraham’s thigh and swore to carry out the task. Stopping by a well in Nahor, he prayed to God and asked that the woman who offered him a drink would be the future wife of Isaac and behold, Rebekah, the beautiful granddaughter of Abraham’s brother Nahor fulfilled this request. Both Rebekah and her brother, Laban invited him to their house. The man explained his quest and Laban and Bethuel, his father, agree to him taking Rebekah, and she agrees to go. 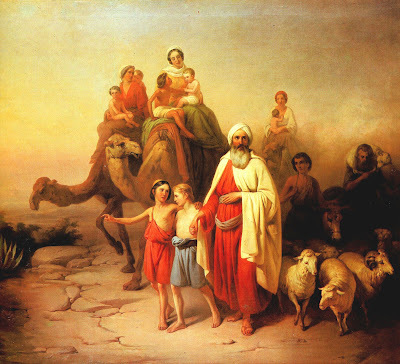 Isaac went out to the Well of Vision and saw the camels approaching. 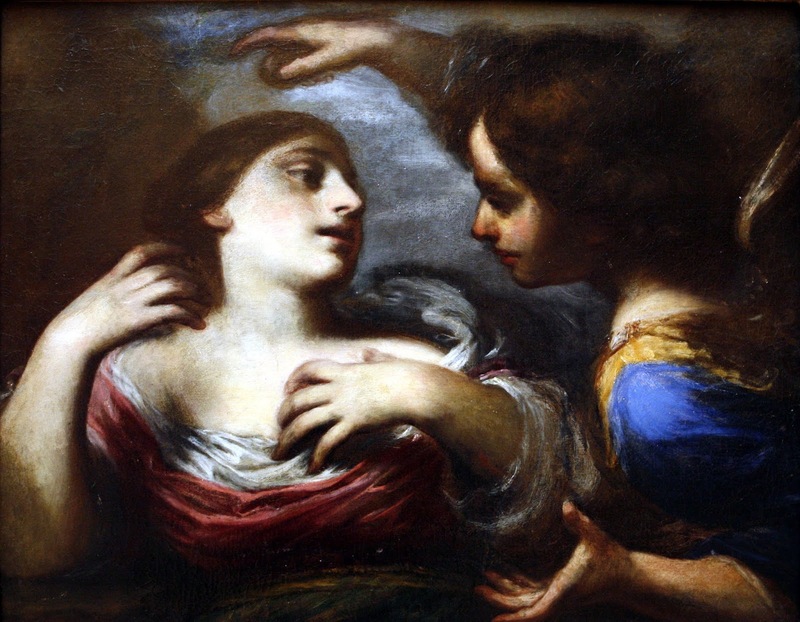 When Sarah realized he was her betrothed, she veiled herself and Isaac took her into Sarah’s tent to be his wife and was comforted from the loss of his mother. Abraham took a second wife called Keturah and she bore him many sons. He gave all his possessions to Isaac and gifts to his concubines as he sent them away. He died at the good age of 175 and was buried by Isaac and Ishmael in the cave with Sarah. Isaac continued to dwell at the Well of Vision. Ishmael had many sons but Rebekah was barren. Isaac pleaded with the Lord and she conceived twins but they struggled within her. The Lord revealed that two nations were in her womb, one stronger and the older would serve the younger. The firstborn was red and hairy and called Esau and the second, with his hand holding his brother’s heel, Jacob. Esau became a hunter, a favourite of Isaac, but Jacob was a simple tent-dweller, beloved of Rebekah. Jacob cooked a stew and Esau requested some as he was dying of hunger, but Jacob convinced him to sell his birthright for it.